A friend recommended this book to me when I told her about a YA fantasy book I’m currently writing. So while I began reading from a perspective to examine how the author constructed the book, I found myself completely absorbed with the stroyline in not-to-long. 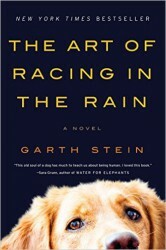 Stein does a masterful job at weaving in crap we face in life from the perspective of the family dog. And he does it in such a way that you can’t help but have your heartstrings drawn taut to the point of breaking several times. While there are many sad parts, just like in life, the reflections of mans best friend help convey what it truly means to be a friend and love another unconditionally…warts and all. Erik, this one is just the “adult” version of Racing in the Rain. I believe this book came out after The Art… Because it was so popular among adults.